Stories told, lessons learned, moments loved. We are starting a unit on prayer this week and are starting out with a discussion on how the Bible tells us to pray. We’ll look at Matthew 6:5-8 to first see how Jesus says not to pray, then look at the Lord’s Prayer and other scriptures to see what we should do instead. I found a neat little game to get our class time started in a lesson on prayer. 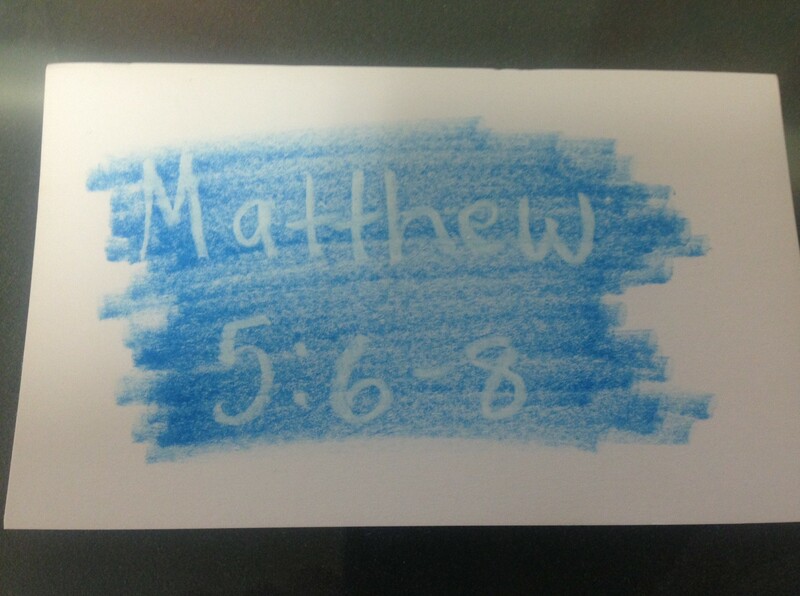 I wrote Scripture verses about prayer in white crayon on white index cards and will hide them around the room. However, several cards have pictures or random words on them. The kids can color over the index card with a marker to reveal what is written in white crayon. We’ll use these verses in our discussion, writing our findings up on the white board. Then we will transition into some discussion. I enjoyed this brief article on some things to emphasize when discussing prayer with older kids, like I will be doing this Sunday. It has some really great thoughts in a concise way of stating them. I’ll definitely be talking about this with my 4th & 5th graders. Prayer does not come easy for me, and I’m sure it doesn’t come easy for a lot of kids. We live in such a busy world, with so many distractions constantly bombarding us. It’s hard to find peace in such a crazy life. That’s when we need to remember that communication is how we build any relationship, especially our relationship with God. Just like I need to be intentional to stay in touch with friends and calendar time to get together and enjoy each other, we need to be intentional about making time for God. Yes, prayer is something we can do anytime, anywhere, and God wants us to “pray without ceasing (1 Thessalonians 5:17)” but we also need to put forth an effort. God wants to be close to us. God wants to answer our prayers. We have to give him that opportunity. Posted on April 21, 2015 by soaring4031	• This entry was tagged 4th grade, 5th grade, activity, age, Bible, children, church, class, elementary, faith, game, God, Jesus, lesson, new testament, prayer, preteens, Sunday. Bookmark the permalink.